There's much activity in my studio as I prepare for the Cloth Road Arts Week which runs from Saturday 3rd May until Sunday 11th May. 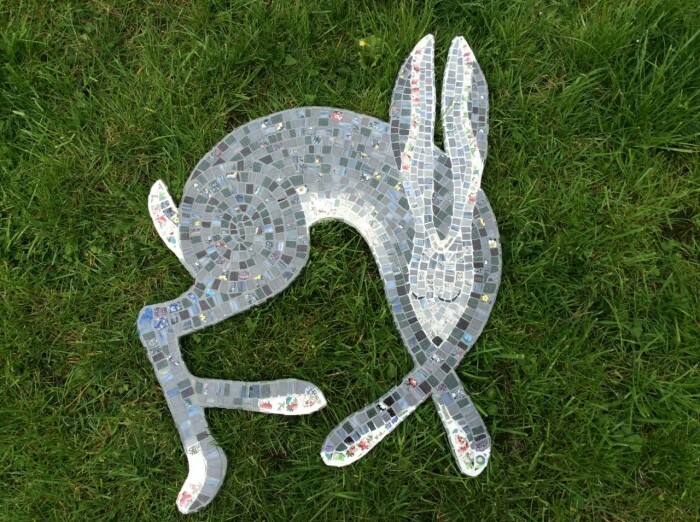 As my homage to spring it felt only right to make the sleeping hare mosaic that has been in my mind to do for quite some time! The shape has been cut out and leant up against my studio wall for over 2 years waiting for me to get cracking. I think it was finding a beautiful china plate with black flower details that finally set the creative juices flowing. It just goes to show that when the time is right everything falls into place. Before breaking up the china and tiles it's important to plan how the mosaic pieces will be placed and to do this you need to spend time drawing the guide lines. Once you've planned the layout the fun can begin! I love the way the detail in the china adds interest and texture to the overall feel. Can you see (in the picture below) the china plate with the black flower detail I mentioned? It takes longer than you may imagine to create a mosaic and the picture above represents 4.5 hours work. I like to listen to radio 4 when I'm working and I get lost in my work as the discussions, current affairs and afternoon plays drift through the air....it's a wonderful life! 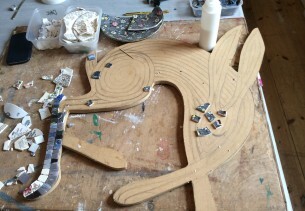 Once I had finished the hind leg I took another look at the ears and redesigned the lay out - I'm pleased I did and it's a good example of how the lines really do define the overall look and feel. And this represents a full days work! .....and it's not over yet because once this is completed it's time to work the edges. Whilst I use a good strong PVA glue for the main body of the work I prefer to use a ready mixed tile adhesive for the edges. It's the same stuff I used in the mosaic heart tutorial and the rules of use are the same - i.e. don't let any of the adhesive squidge up in between the tiles (I am so technical!) Remove any excess with a toothpick. I like tile adhesive because the tiles don't slip and slide which means I can work the entire piece in one sitting but I have to be really careful not to accidentally knock any of the tiles off (easily done!) This is why the mosaic is raised off the table - it allows 360 degree access without touching the edges. 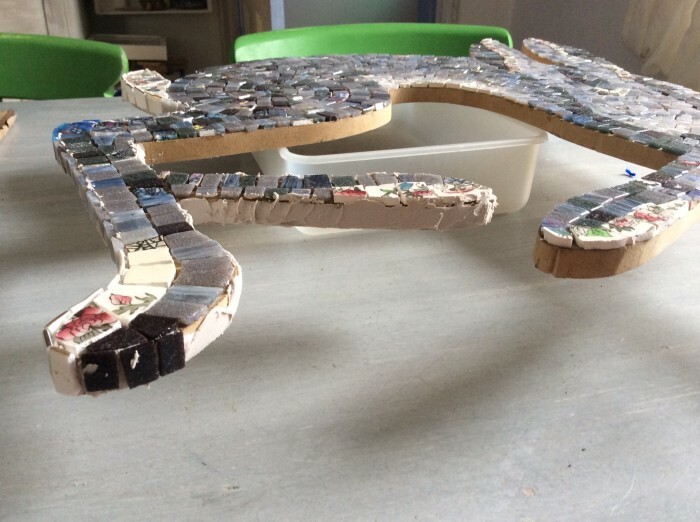 Once the edges are complete and the adhesive has dried (24 hours) it's time to grout the mosaic. I wanted to enhance the contrast between the body and the face and paws so I used a grey and a white grout. Starting with white grout I worked all the relevant areas and cleaned it all up before moving onto the grey areas. My fingers were covered in grout by the time I got onto doing the grey areas which explains the lack of photos for the second part but here at last is the finished piece! Happy Easter!! !